OAG’s influential global OTP rankings are increasingly used across the industry to benchmark flight on-time performance and market the reliability of services to customers. 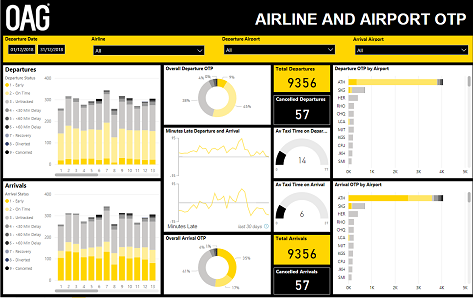 As a KPI for airlines, airports and passengers alike, understanding and improving on-time performance to deliver a seamless experience has never been more important. 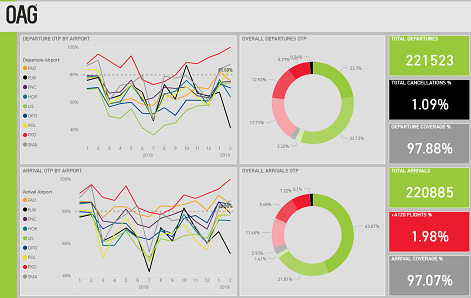 With the OTP dashboard, you can continually benchmark flight on-time performance against key criteria and competitors, analysing where and how you can improve flight reliability and, ultimately, your punctuality. How can I keep on top of my OTP ranking? When you are under pressure to better manage your OTP, you can use our dashboard to generate bespoke versions of On-Time Performance reports on demand to regularly monitor your ranking. With access to granular data behind the rankings, you can drive meaningful punctuality improvements, based on accurate operational information. 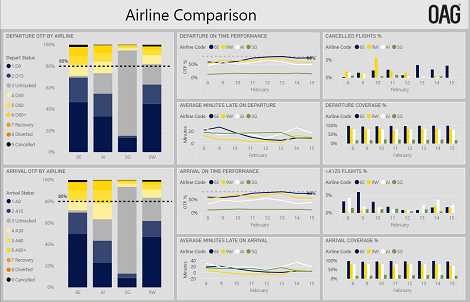 Reports can also include variables such as taxi times, turnaround times and block times, while overlaying contextual data (weather, air traffic control reports), vital for further insight and analysis. Simply fill in your details below and we will be in touch to arrange your trial. By submitting your details you are agreeing to receive a response from OAG. See our privacy notice. See OTP by airline, airport group, or flight number. See the status of each flight e.g. on time, early, late, cancelled or diverted. See how long delays occurred e.g. 15 mins, 30 mins, or 60 mins.